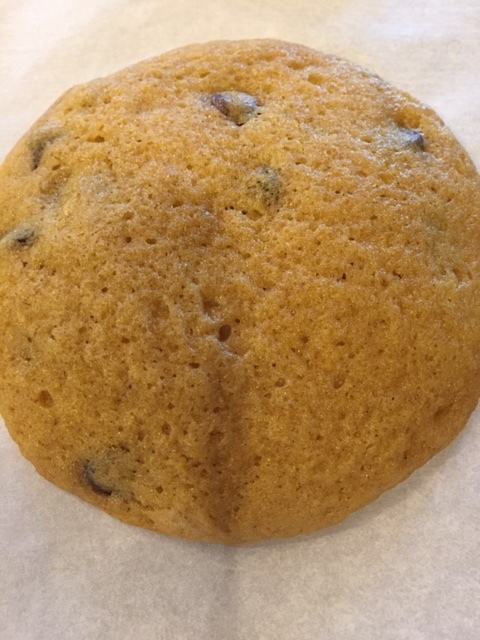 Nothing is more perfect than a pumpkin chocolate chip cookie. Especially one that is a family tradition. This recipe will go into the family cookbook that I haven’t worked on since I told you all about it. I make these cookies in October and all of a sudden it’s November and I forgot all about them since October got completely away from me. Of course it’s not too late as they are also perfect for November. 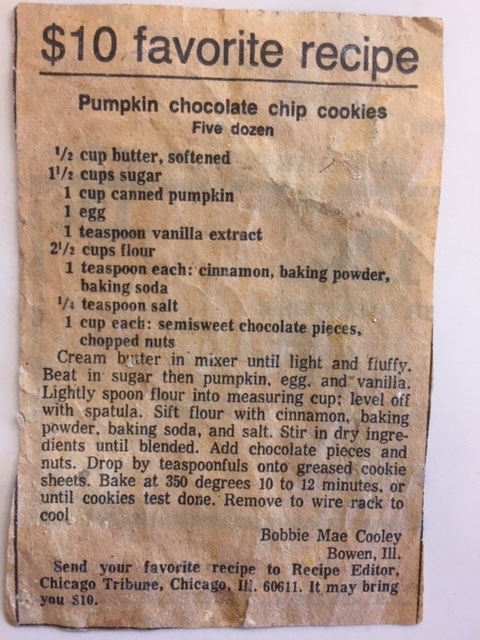 I got Bobbie Mae’s recipe out of the Chicago Tribune in the 1970’s, for which she won $10. I have been making them since. In making them the other day, I decided for once to follow Bobbie Mae’s recipe exactly. Wait. Did I put in four cups or five cups of flour? I’m sure it was the five I needed but was it? She instructed readers to lightly spoon the flour into a one cup measure and then level off with a spatula. That is how I lost control of the flour as I doubled the recipe. How could you lose count of just 5 cups of flour? Easy. I decided to experiment. Usually I bake them as soon as I make the dough. It’s hard to wait. This time I decided to bake a few right away, refrigerate some of the dough, and freeze some in my mini muffin pan. That way I could tell you which way was best. Let me tell you right now that it didn’t make a darn bit of difference. The dough was easier to scoop after being refrigerated, but that was about it. The dough also did not freeze so it was like being refrigerated. I knew almost right away that I had put in 4 and not 5 cups of flour. Too late for most of the batch. Gooey dough made really gooey cookies that are impossible to pick up and eat unless you freeze them. The frozen cookies are all stuck together. When you try to get one, you get at least three. Maybe that’s not all bad. I added a bit of flour to the dough I hadn’t formed yet. Even if you add the correct amount of flour, I recommend that you don’t put them in a cookie jar because at room temperature, they will still stick together. Ours are always in the freezer and let me tell you, when you take one out and warm it for a few seconds in the microwave, you are in pumpkin heaven. 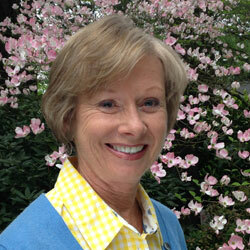 The bottom line is: pay very close attention to your cups! I wonder if I will need a better photographer than me to take pictures for the cookbook. What do you think? We have a margarita recipe we inherited from a party-loving VP of Engineering at Cessna….who surprisingly became a pastor of a local church after we all got summarily chopped from the payroll in 2010. It calls for plenty of tequila (natch) along with various amounts of mix, Grand Marnier, Cointreau and Triple Sec, calling out quantities for some in cups, others in jiggers and others in ounces. To make things worse, I always make a double batch since you don’t want to make a single batch, run out in the middle of a festive party and try to make a second batch when your well in your cups…so to speak. Funny, but I’ve never had any complaints either! OK! I think I’m the winner in that one! Definitely baking season. Happy Thanksgiving to you too! VERY easy to lose count of your cups and teaspoons!!! And don’t talk on phone while baking…for sure you will lose count! Ha!! 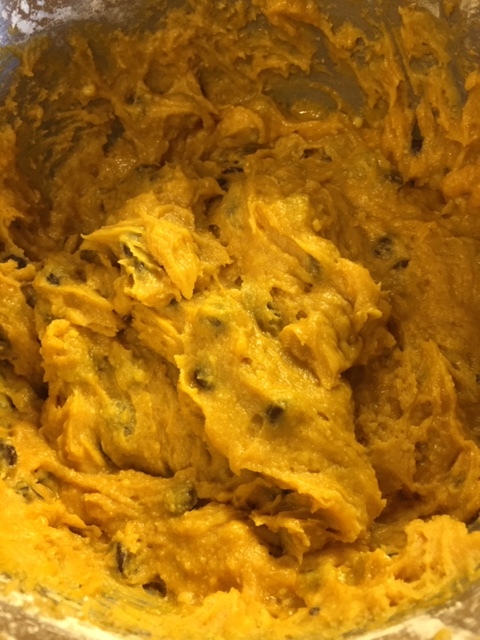 I love pumpkin and chocolate chips…but together? Really a fam fave eh?? I trust you as you are a good cook/baker. Just trust me and yes, do not ever get distracted. Focus!